[VanFoodies eat Toronto] Fat Pasha – We could do without meat! 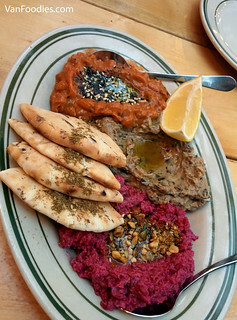 While we were in Toronto, our friend BD and JG took us to a Middle Eastern restaurant called Fat Pasha. Looking at its website, it has some interesting items, including meat options for the carnivore in Mr. and I, and many vegetarian options for BD and JG. We ordered a bunch of things to share, plus a couple meat dishes that Mr. and I got to enjoy all by ourselves. First of all, a Salatim Platter. You can order 3 things for $14, or 5 for $23 or 7 for $32. We chose the Beetroot Relish, Cranberry Bean and Chopped Eggplant. We ate with our eyes first as the platter had such beautiful colour combination and it’s quite pretty to look at. The beetroot relish had a nice pink hue, a little bit acidic, quite refreshing on the palate. The cranberry bean was slightly spiced, but you can still taste the tartness in cranberry. The chopped eggplant was meaty, had the most savoury mouthfeel to it. I liked the addition of chopped nuts and oil drizzle and a dash of sea salt on top of the spread, to add some texture and depth of flavours. The accompanying pita bread was hot to the touch, seasoned and we kept on ordering more to finish the spread. 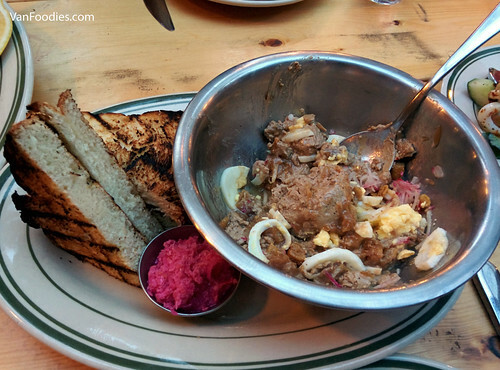 The Chopped Liver and Onions was a tasty take on liver mousse. When the plate arrived, we had to mix in the liver with onions and a hard boiled egg. It came with slices of grilled bread and pickled horseradish. I’m usually not a horseradish fan but this was quite mild and the peppery note really helped with the liver taste. This was quite a generous portion of liver mousse and Mr. and I thoroughly enjoyed it.